No, not a quote from a 2009 Overgrown Path post, but an extract from an article in Friday's Independent reporting a resurgence in vinyl sales. This report, which is based on BPI year-end data, contains many important lessons for classical music. Disillusionment with the sound of low-resolution audio is spreading beyond audiophiles, resulting in a post-digital behavioural response - aka negative reaction - among mass market music buyers to dumbed-down sound quality. Other lessons are that even in an era of virtual reality the tactile and the visual are still prized, listeners are prepared to trade convenience for quality, and dual format listening (remember vinyl at home and cassettes in car?) is returning - header photo shows vinyl turntable with iPod dock. That description of how consumers stream music on mobile devices but listen to vinyl at home confirms that the music market is segmenting and refusing to conform to the convenient but erroneous single mass market model. Another noteworthy lesson for classical music is that the post-digital behaviorally responsive sound quality freaks with spending power are at the younger end of the market. But there is one even more important lesson from this report. The last thing that Universal Music and the rest of the corporate nexus want is vinyl regaining market share: because vinyl records resist digital rights management solutions and are expensive to press, warehouse and ship. But, despite this, there is a major resurgence in vinyl sales. Which just goes to show that what big music prescribes, the market need not accept. Forget all that baggage about clicks and plops on vinyl; this is not a debate about vinyl versus MP3; because SACD and Blu-ray audio discs, and lossless music files all deliver audio quality that is significantly better than the ubiquitous MP3. This debate is about the much wider tension between commercially driven reductionism and consumer powered aspiration. And those pointers from the BPI report take us beyond recorded music to live classical music, which is also under siege from the reductionist forces of big music. Now here, inspired by reports of a vinyl resurgence, is a suggestion. The Association of British Orchestras should invite Universal Music ceo Max Hole back to their 2014 conference and ask BBC Radio 3 controller Roger Wright to join him in recommending a strategy for the future of classical music. The orchestras should then do the exact opposite of everything that Max Hole and Roger Wright recommend. If they do the opposite, I'll wager that classical music audiences - like vinyl sales - will suddenly increase. Also on Facebook and Twitter. 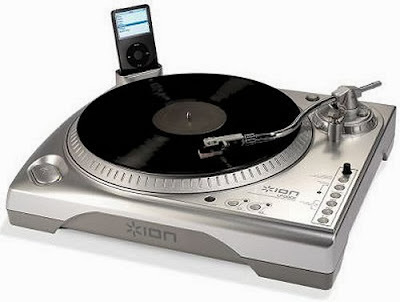 Header photo of Ion USB turntable with iPod dock via Geek Alert. Any copyrighted material on these pages is included as "fair use", for the purpose of study, review or critical analysis only, and will be removed at the request of copyright owner(s). I've never quite gotten the vinyl revolution: it still isn't a pure analog sound. It may be better than a CD's 44.1/128 sampling/bit rates, but the source of modern vinyl is still a digital master, so there has already been the loss of the pure analog sound of the original recording session...particularly if the material was digital recorded to start with. Vinyl is only as good as the source material's playback. It can't magically smooth out a digital master to true analog quality, and one might say that some of the 'warmth' difference that isn't an illusion of expectation is actually the engineer giving the tone range a little boost so the vinyl is in effect a different mix than the CD or SACD/DVD-A. And yeah, I still can't stand vinyl because i start hearing pops/cracks almost instantly (even a brand new record) and find them terribly distracting, especially for quiet 12-tone passages like Webern and Boulez. Last record I bought was a picture disk of Oldfield's Tubular Bells, and that was for the collector's value, not the music. Quite so Joe. But, as I say in the post, this is not about the pros and cons of vinyl. It is about the superior involvement offered by higher quality audio formats. Vinyl may be a fringe taste, but, as I point out, SACD and Blu-ray audio discs, and lossless audio files are all viable superior quality alternatives to MP3. However these formats are not being given the prominence they deserve, largely due to the commercial agendas of the corporate labels. actually, the problem is a bit more than just 'agenda'. One issue of agenda is market size, and with the lossless (or hi-quality) digital market divided into 4 standards (SACD, DVD-A which not all DVD players can manage, Audio on standard DVD, and BluRay), there isn't a clear market leader to go to. They tried all that in the 2000s and found a lack of sales because of a lack of a large enough market with each one. Only concert DVDs sold because they, of course, have the visuals to go with it. Vinyl has 3 advantages: it is a known commodity to most by reputation (even if in the digital mastering age, that reputation of analog warmth and purity is a legacy, not a reality), the players are cheap, and you don't have to worry about whether or not it supports 'format-X' of some obscure DVD standard like DVD-A. The fact that the labels generally have commercial ties to one particular standard's owner over another (well, did, prior to the Universal takeover of just about everybody), means there remains a lack of interest in pushing material that someone else has a patent on. Vinyl is thus being recognized for its universality, including the lack of operating patent costs, where-as the other standards are known for their collective incompatibility and lack of a significant market size due to those very costs. One could say the labels gave up too soon on high-quality digital formats, but at this point the lack of sales is also an aspect of the larger lack of interest for owning ANY music media. Vinyl may be higher in proportion of physical music sales than one might expect, but physical music sales on the whole still continue to decline and vinyl isn't going to save it. If anything the high mark-up and profit actually will mask it more, making the fall that much more devastating to both fans as well as artists.